LOS ANGELES–(BUSINESS WIRE)–MedMen Enterprises Inc. (“MedMen” or the “Company”) (CSE: MMEN) (OTCQX: MMNFF) (FSE: A2JM6N) announced today unaudited systemwide revenue for its fiscal 2019 second quarter ended December 29, 2018. Across the Company’s operations in California, Nevada, New York and Arizona, systemwide revenue was US$29.9 million (CA$39.7 million). This represents a 40% quarter-over-quarter increase over its fiscal 2019 first quarter ended September 30, 2018. Systemwide revenue, pro forma for pending acquisitions that have not yet closed, was US$49.5 million (CA$65.7 million) for the quarter. For the second quarter, gross margin across its retail operations was 54%¹, compared to 45% in the previous quarter. The Company is expected to post its fiscal 2019 second quarter results in February. 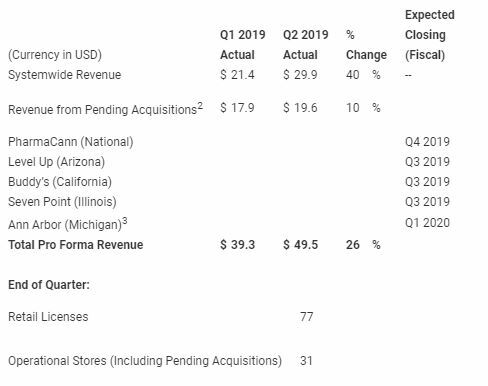 Systemwide retail revenue for the quarter, including revenue from pending announced acquisitions, is based on 31 retail stores that were operational at the end of the quarter. This includes the MedMen Paradise location near McCarran International Airport in Las Vegas, which opened in October, and the MedMen Scottsdale location in Arizona, which opened in December through the closing of the Monarch acquisition. The operational retail locations, including pending acquisitions, represent 40% of the 77 total stores that the Company is licensed for across 12 states. Strong systemwide retail revenue for the quarter is primarily attributable to MedMen’s stores in Southern California’s recreational market. In California, the Company’s eight retail locations reported a combined US$23.7 million (CA$31.4 million) in revenue, which represents a 27% quarter-over-quarter increase. Cowen’s most recent estimate projects California will be a US$11 billion market by the end of 2030 4. California is the prize of the cannabis industry and the performance of our stores, quarter-over-quarter, is a reflection of our continued execution in our home state. 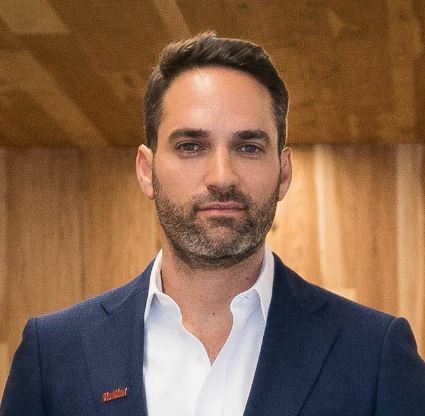 Adam Bierman, MedMen chief executive officer and co-founder. In addition to growing revenue at its existing locations, the Company has 16 new locations slated to open during calendar year 2019, including 12 locations in Florida, where the Company is licensed for up to 30 locations. The Company is set to open four retail stores in Florida in the next 90 days, which include locations in Miami Beach, Orlando, West Palm Beach and Key West. USD/CAD of $0.7543 as of January 16, 2019. 3 During the quarter, the Company signed a definitive agreement to acquire a retail operation in Michigan through a combination of cash and shares. The Company does not disclose deal values for transactions it deems immaterial from a purchase price standpoint. 4 Cowen Group per “Cannabis: $75B Opportunity; Category Cross-Currents Keep Us Cautious on Booze”.